A wire beam position monitor extracts the photo-current from a thin metallic wire as it is scanned across the beam. This gives a profile of the beam power distribution parallel to the axis of displacement of the wire. Two wires perpendicular to each other (“crossed wires”) can also be scanned on a single frame to provide additional information on beam shape. 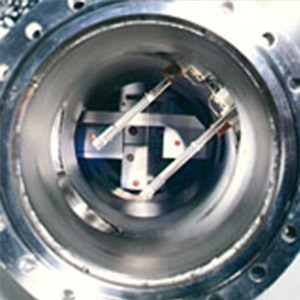 Information from the monitor can be incorporated into a feedback system to the synchrotron ring steering magnets to control beam position, angle or provide information on beam stability.